Limited vinyl LP repressing. 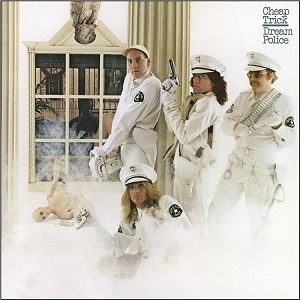 Dream Police is the fourth studio album by Cheap Trick. It was released in 1979, and was their third release in a row produced by Tom Werman. It is the band's most commercially successful studio album, going to #6 on the Billboard 200 chart and being certified platinum within a few months of it's release. Dream Police shows the band expanding into longer, more complex songs and incorporating orchestration on several tracks. The album's title track became a Top 30 hit for the band. "Voices" was also a hit, reaching #32 on the Billboard chart. Near the end of "Gonna Raise Hell" the orchestra is citing a snippet from "Heaven Tonight".